In September 2008, Metrolinx launched a regional transportation plan – The Big Move – a 25-year, $50 billion plan for coordinated, integrated transportation and transit in the Greater Toronto and Hamilton Area (GTHA). One of the first wave of projects currently underway is the Eglinton Crosstown, which represents an investment of $5.3 billion (2010$) toward better transit in Toronto. 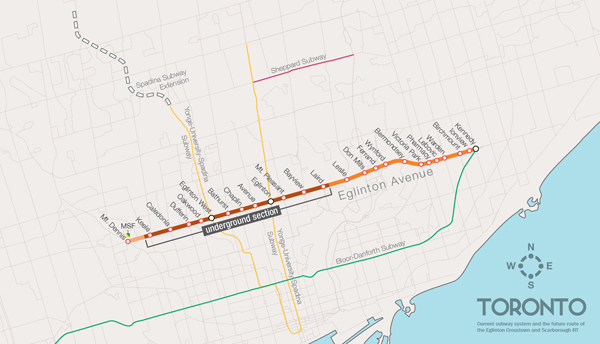 The Crosstown is a light rail transit (LRT) line that will run across Eglinton Avenue between Mount Dennis (Weston Road) and Kennedy Station. This 19-kilometre corridor will include a 10-kilometre underground portion, between Keele Street and Laird Drive. The Crosstown is part of the $8.4 billion (2010$) investment from the Ontario government to expand transit in Toronto. The Crosstown project is the largest transit expansion in the history of Toronto. Construction is currently underway and the Crosstown service will begin in 2020.